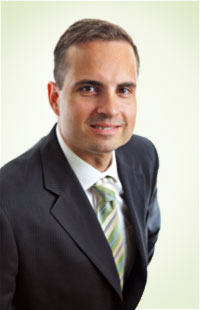 Peter is a Obstetrician Gynaecologist specialising in High Risk Pregnancy. He finished his medical degree at the University of Melbourne in 1996, and after a short stint in General Practice he then went on to train as a specialist Obstetrician and Gynaecologist through Monash Health. Peter pursued his interest in managing complicated pregnancy by completing Fellowship years in maternal-fetal-medicine (MFM), looking after the highest risk pregnancies. He also has expertise in fetal ultrasound, and complicated vaginal births such as twins, rotational forceps and breech deliveries. Peter is the Director of the Women’s Health specialty training program for Monash Health which is the largest Women’s Health service in Victoria. Peter has been appointed as a consultant at Monash Health in the highest risk pregnancy (MFM) clinic and is head of unit of the multiple pregnancy/preterm birth clinic. He runs a fortnightly clinic to turn babies from breech to head-first presentation (ECV). He is in a private obstetrics cover group with Prof Euan Wallace, Dr John Regan, Dr Danielle Wilkins and Dr Ryan Hodges, and will care for pregnancies at Jessie McPherson and Cabrini Private Hospitals. Peter is also a general gynaecologist operating privately out of Jessie MacPherson and Waverley Private Hospitals.